UK's Symphony Orchestra and Chorale will play a live soundtrack with the movie "Amadeus" April 26-27, at Singletary Center. 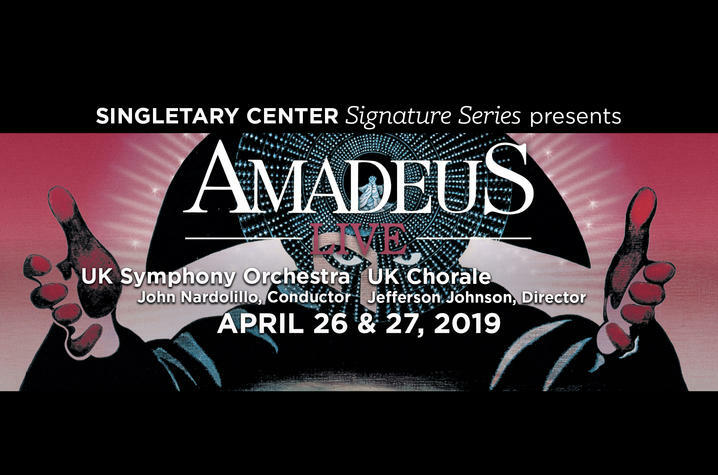 LEXINGTON, Ky. (April 15, 2019) — The University of Kentucky Singletary Center Signature Series will bring together UK Symphony Orchestra and the UK Chorale to showcase the life and music of one of the world's most famous composers of all time in Amadeus Live April 26-27. Audience members will have the rare opportunity to watch the film "Amadeus," as Wolfgang Amadeus Mozart's most celebrated works are performed live in-sync by the full orchestra and choir. The film is R-rated and parental discretion is advised. Amadeus Live will be presented 7:30 p.m. Friday, April 26, and Saturday, April 27, in the Singletary Center Concert Hall. Tickets are priced by seating location. Student tickets are $25 and adult tickets range between $35 and $45. Additional processing fees will be applied to the ticket purchase. Tickets can be purchased at the Singletary Center box office, by phone at 859-257-4929 or online at http://www.scfatickets.com. Discounts are available to faculty and staff only in person at the Singletary Center ticket office. A part of the UK College of Fine Arts, the Singletary Center for the Arts presents and hosts around 400 artistic, cultural and educational events annually for the university community, Lexington community and the Commonwealth of Kentucky.